Falken FK 452 tires are among some of the elite high performance summer driving tires on the market. With a Z speed rating to go with an advanced unidirectional tire design, this is one serious low profile tire for your European or domestic luxury vehicle. The Silica tread compound and dual circumferential grooves provide excellent traction on rain soaked roads, while the superior tread design enhances high speed driving and handling. Falken has utilized their vision for how performance tires should handle on the road into the FK 452. 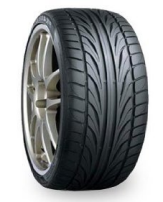 The Falken FK452 ranges in price from approximately $110 for a 16 inch series, to over $450 in a 22 inch series tire. Who Is This Falken Tires FK 452 Designed For? Falken has designed this high performance luxury tire for drivers of all types of foreign and domestic mid and full sized cars who are looking for top of the line summer performance. Due to these Falken FK 452 tires being high performance summer driving tires, no treadwear warranty is provided. Falken does provide a lifetime guarantee, down to 2/32″ remaining treadlife, for materials and workmanship.